A friend was speaking to me about the difference between Transformational and Incremental Change last night. Incremental Change is the step by step achievement of a goal. Transformational Change is the inner transformation in our mind, body, spirit and heart that fashions us into one who can naturally and easily fulfill our goals and purpose. When I heard this distinction, I realized that I am an agent of Transformational Change, utterly devoted to the mastery of this process within myself and others. While Transformational Change is facilitated mightily by private coaching, retreat and reflection are also essential elements. I have learned that Transformational Change is readily available in the grace drenched splendor of nature, in beautiful physical surroundings away from the day to day, in sacred silent circles of individuals who are asking similar questions. a soft pillow to lay your head on at the end of the day. Hint, Hint…time to retreat my friend! Will you book some retreat time on your calendar today? 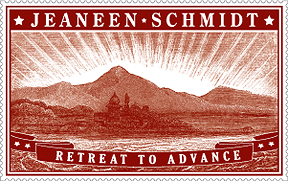 Oh, all right, you can still register for the Sept 25 Retreat to Advance day here. Registration closes on Sept 11.